Got this tea as a gift. The tea is a yellowish-greenish color and came sealed in a clear glass container. The tea had a very smooth taste, with a slight bitterness. I did add a little Truvia that gave it a some sweetness towards the end, It also has very similar characteristics to Dragonwell green tea. I think this is a great "first green tea" for those first exploring the variety. What if you could boost your immunity, control your stress and lose weight with one simple drink? Medicine Hunter Chris Kilham says you can with matcha! Learn about its health benefits and how much you should drink! How many of these superfoods do you take? I regularly have three of them with pomegranate being the only one that I have not tried. Let me know if you eat any of them! Drinking five cups of green tea every day may extend one’s lifespan. 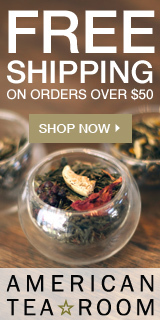 It's been a great year so far, and California Tea House wanted to share a couple of great new deals on their site. They are releasing a new Matcha tea called "Stone Ground Ceremonial Matcha" and to celebrate they are giving it away free with each $20+ order... This expires 6/30. The Here is the link to this deal: Free Matcha! Also, for Memorial Day weekend they are offering $20 off all orders of $100 until this coming Tuesday 5/28. Here is the link to that deal: $20 off of $100 - Memorial Day Special! The purpose of RateTea is to encourage people to develop their appreciation of tea and promote sustainability in the world of tea. RateTea was founded in 2009 by Alex Zorach, and is owned and managed through Merit Exchange LLC. RateTea launched to the public on Sep. 18, 2009. They keep a database of teas indexed by brand, style, and region. Although it is not the largest database on the web (Steepster currently has a larger database), the site claims to be the most detailed database available. Single-region teas are classified to the level of provinces, states, districts, or counties, when this information is available. Rather than classify teas broadly (black, green, etc.) they identify particular varieties of each of these broad classes of tea, both to help people discover the vast richness of tea traditions, and also so that teas can be compared against truly similar teas. I usually like to have green tea lattes in the morning but this evening I was just in the mood. Here is my easy recipe. All you need is a teaspoon of matcha green tea, milk (I prefer almond milk) and a little sweetener. Mix the matcha power in 6 oz of hot water. Stir until dissolved. Add 6 oz of almond milk plus sweetener (I prefer Truvia). Stir again. Pop into microwave for 30 seconds and enjoy! Did you know that one glass of matcha is the equivalent of 10 glasses of green tea in terms of its nutritional value and antioxidant content. You can probably tell by now that I really like Matcha green tea. Here a great video from my friends at Matcha Source on how to sift, whisk and enjoy Matcha green tea. I love Saturday mornings and no better way to start the weekend than with a green tea smoothie. Directions - Blend, drink and enjoy the weekend! Here is a simple recipe for a Green Tea Cheesecake from Stella at the blog "A Paint of Life". She was kind enough to allow me to share her recipe here. Hello, I’m Steve. I’m 55, live in Dayton, Ohio and I have a passion for everything green tea. I love learning and expanding my knowledge of green tea and its health benefits, and then sharing it with others. I have varied and diverse interests that include the love of golf, basketball, wine, and music (alternative and smooth jazz). I’m married to the most wonderful woman in the world and have three grown children (all girls). I have always been a tea drinker as I never acquired the taste for coffee like everyone else around me. But my love for green tea really started when I was diagnosed with chronic lymphocytic leukemia or CLL. CLL is the most common type of leukemia. Most people are diagnosed without symptoms as the result of a routine blood test that returns a high white blood cell count, as was in my case. I’m still in the early stages in what is called “Watch and Wait” mode, and my goal is to stay in this stage and never have to be treated! I used to consume a lot of carbonated beverages. This was not good from a nutrition standpoint, as nutrients play a key role in taking care of my CLL. Over time I have learned about the connection between what we consume and how it contributes to our overall health. My tea preferences are still evolving. I really like teas, both hot and iced. I’m still learning about loose teas and how to brew them. My favorite drink when I’m out and about is a Matcha tea latte from Starbucks.